We're located 50 miles South of Bangor, Maine on the Blue Hill Peninsula. Latitude 44 degrees, 18 minutes, 56 seconds North; Longitude 68 degrees, 42 minutes, 21 seconds West. Please note: "Google Maps" and "MapQuest" instructions are not necessarily the best. So print this out and bring it with you. It will make a big difference as you leave Bucksport. From Bangor, Maine (Bangor International Airport-Domestic and international flights)...50 miles or about 1 hour's drive. From Trenton, Maine (Bar Harbor Airport/smaller commercial airlines)...35 miles or about 45 minute's drive. From Camden, Maine...60 miles or 1 1/2 hour's drive. From Portland, Maine...142 miles or 3 hour's drive. From Boston, Massachusetts...250 miles or 5 hour's drive. From Quebec City, Quebec...279 miles (440 km) or 5 hour's drive. The red "X" on the first map shows our general location on the Maine coast. The second detailed map has red dots marking the intersections described in the driving directions that follow. Follow the written instructions carefully since roads with identical route numbers loop all through our community. Take Interstate 95 north to Exit 44 (formerly Exit 6-A). From there, take Interstate 295 north to where it re-joins Interstate 95 in Gardiner. Take Interstate 95 north to Exit 113. From this exit, take Route 3 east to Bucksport (watch out for speed control officers in Bucksport). Stay on Route 3(and R15) for a few miles (The Big Apple gas station is at the junction where R15 turns off toward Blue Hill). Turn right onto R15 south to the town of Blue Hill. As you enter downtown Blue Hill, Jud Hartman Gallery is straight ahead. You will see the first of several of our official Maine DOT road signs on the right just as you enter downtown Blue Hill. They are dark blue with white letters and say "Oakland House Cottages & Hostel." They will lead to way to us. Turn right on R15 toward Sedgwick & Deer Isle. Continue South through Blue Hill. When you reach the round-about, head straight on Rt. 15 toward Stonington and Deer Isle. Drive about four miles and turn left at the stop sign. This is the intersection of Snow's Cove Road and the Mines Road, to the right is R176; to the left is R15. Turn left on R15 toward Deer Isle. You will be on Snow's Cove Road/R15. Follow R15 South toward Deer Isle and Stonington. Drive about three miles. Eventually you'll drive to the crest of the hill. As you approach you'll see the sign for R175 and for "Holbrook Island Sanctuary" to the right. There will be a four-way intersection here. Leave R15 and turn right on R175 and go toward "Holbrook Island Sanctuary and S. Brooksville." You will be on Coastal Road. Coastal Road goes down the hill. You'll drive over a little bridge that spans the North end of Walker Pond. After the bridge will be several houses, and the road will split (R175 goes right). Make sure you stay to the left and continue on Coastal Road. There is a large sign that points left to "Holbrook Island Sanctuary." Stay left on Coastal Road. Drive approximately 1 mile passing Lakeview Cemetery's arched gate on the left. As you wind down the hill, Herrick Road is on the left (it is not a cross street, it only goes left off Coastal Road). Oakland House is about 2 miles down Herrick Road on the right. Note that Google Maps has mislabeled Herrick Road, Walker Pond Road. The white barn is at the entrance. The old hotel is just down Oakland House Road. You will check in at the old hotel having received instructions prior to your arrival. It's a short drive to the Hostel@Acorn. There is parking by the building. In Augusta continue on I-95 North and stay on it to Bangor. Take the first Bangor exit (Exit 182 onto I-395 East). From I-395 take the first Brewer Exit (onto Route 15 South) which is just as you go over the bridge. Stay on Route 15 South. It will take about 20 minutes to get to Bucksport. Bucksport rigorously enforces its speed regulations. Fines can be steep. 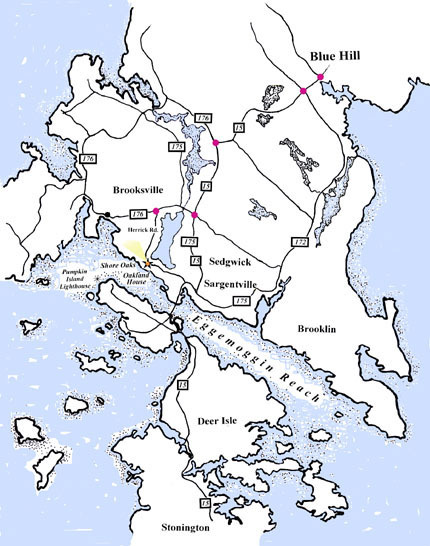 From Bucksport continue on Route 15 South toward Blue Hill, Deer Isle and Stonington. Follow the directions above from Blue Hill. By car from further Downeast (north or northeast): Our driving directions from Blue Hill are the easiest to follow if you've never driven in this area. By train: The Amtrak "Downeaster" provides service from Boston to Portland, Maine. Ask for the up-grade business service. You'll get a larger seat and nicer ammenities. WiFi comes on this route. You can rent a car in Portland and drive the three hours to Oakland House. Plan to stop in Freeport on your drive. The home store of LL Bean is there. You'll be in Maine, what else? By Bus: We can recommend Concord Trailways Bus from Boston to Bangor. Rent a car in Bangor and drive an hour and 15 minutes to Oakland House. By plane to Bangor: US Air, American, Delta and United fly into Bangor. There you can rent a car and drive an hour to Oakland House. There is a small airport in nearby Hancock County-Bar Harbor Airport in Trenton, Maine. It's between here and Bar Harbor. It's served by US Air. If you own your own plane this might be the place to fly into as well. There are also scheduled flights. Blue Hill has a small landing strip for small private planes. By Boat: The GPS coordinates of our entrance from Herrick Road are: Latitude 44 degrees, 18 minutes, 56 seconds North; Longitude 68 degrees, 42 minutes, 21 seconds West. We're labeled "Herricks" on the USGS topographical map. While we have a mooring field a number of the moorings are owned/occupied by others. Oakland House has two which have their own markings. This is an active waterfront so we ask guests not to tie up their boats on the dock which is now owned by others. If you arrive by boat you may drop anchor (or take one of our moorings by prior arrangement) and come ashore by your own dingy which you may keep on the shore at Herricks Landing.